ابراهیمی, محمود, عطاری لر, شکوه. (1397). ‌‌‌‌ تأملی بر قدرت شفابخشی امواج. مجله صوت و ارتعاش, 7(13), 104-119. محمود ابراهیمی; شکوه عطاری لر. "‌‌‌‌ تأملی بر قدرت شفابخشی امواج". مجله صوت و ارتعاش, 7, 13, 1397, 104-119. ابراهیمی, محمود, عطاری لر, شکوه. (1397). 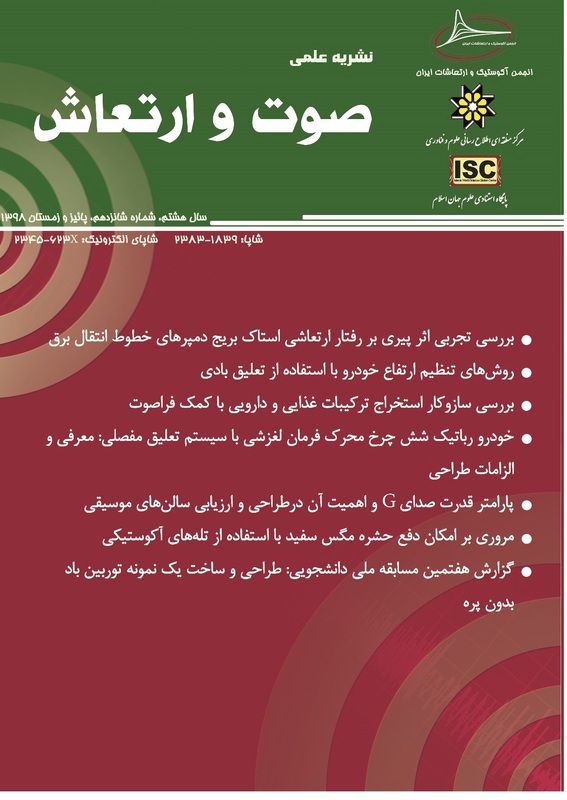 '‌‌‌‌ تأملی بر قدرت شفابخشی امواج', مجله صوت و ارتعاش, 7(13), pp. 104-119. ابراهیمی, محمود, عطاری لر, شکوه. ‌‌‌‌ تأملی بر قدرت شفابخشی امواج. مجله صوت و ارتعاش, 1397; 7(13): 104-119. تمام مواد چه زنده و چه غیر زنده دارای تحرک و فرکانسی ویژه بوده که از فرکانس های دیگر تأثیر گرفته و تأثیر می گذارند. سلول های زنده دارای فرکانس های مخصوص بخود بوده و نسبت به فرکانس های اعمالی پاسخ می دهند، درحالیکه، فرکانس هایی که در تعادل و توازن با بافت زنده نباشند، موجب بیماری می شوند. با استفاده از ابزارهای درمان فرکانسی می توان این عدم توازن ها را قبل از اینکه منجر به بیماری شوند، اصلاح نمود. این ابزارها مکمل روش های درمان مدرن بوده و هیچگونه عوارض جانبی ندارند. نبود اثرات جانبی و تأثیر فرکانس ها بر بیماری بسیارجالب توجه بوده و بنظر می رسد که راهی طولانی جهت درک بهتر و استفاده بیشتر از این تکنولوژی در پیش است. در این مقاله تلاش شده است بطور خلاصه با انواع روش های مبتنی بر فرکانس درمانی چه از نوع فرکانس های صوتی و چه نوری آشنایی اولیه حاصل شده و راه برای تحقیقات جدیدی در این زمینه ها گشوده شود. درمان هایی از نوع صوتی، فراصوتی، سونودینامیکی، ژن درمانی، آپوپتوزدرمانی، بهبود بازده شیمی درمانی و موزیک درمانی معرفی شده است. بعلاوه، درمان های نوری از قبیل فوتودینامیک درمانی نیز بررسی شده است. این روش ها قادرند به تنهایی و یا همزمان با داروهای دیگر در درمان انواع بیماری های روانی، شنوایی، دیابت، سکته، سرطان، بیماری های عروقی، عفونت ها، پوکی استخوان، انسداد شریان های قلبی، آب سیاه یا گلوکوم، آسیب های عصبی، زخم های پوستی و شکستگی های استخوان بکار گرفته شوند. تمام مواد زنده و غیرزنده دارای تحرک و فرکانسی ویژه هستند که از دیگر فرکانس­ها تأثیر گرفته و بر دیگر فرکانس‌ها تأثیر می­گذارند. سلول­های زنده دارای فرکانس­های مخصوص به خود بوده و نسبت به فرکانس­های اعمالی پاسخ می­دهند، درصورتی‌که، فرکانس­هایی که در تعادل و توازن با بافت زنده نباشند، موجب بیماری می­شوند. با استفاده از ابزارهای درمان فرکانسی می­توان این عدم توازن­ها را قبل از اینکه منجر به بیماری شوند، اصلاح نمود. این ابزارها مکمل روش­های درمان مدرن بوده و هیچ‌گونه عوارض جانبی ندارند. نبود اثرات جانبی و تأثیر فرکانس­ها بر بیماری بسیار جالب توجه بوده و به‌نظر می­رسد که راهی طولانی جهت درک بهتر و استفاده بیشتر از این تکنولوژی در پیش است. در این مقاله تلاش شده است تا به‌طور خلاصه با انواع روش­های مبتنی بر فرکانس درمانی چه از نوع فرکانس‌های صوتی و چه از نوع نوری آشنایی اولیه حاصل شود و راه را برای تحقیقات جدید در این زمینه­ ها بگشاید. درمان­هایی از نوع صوتی، فراصوتی، سونودینامیک[i]، ژن درمانی، آپوپتوز[ii] درمانی، بهبود بازده شیمی درمانی و موزیک درمانی معرفی شده است. علاوه‌بر آن، درمان­های نوری از قبیل فوتودینامیک[iii] درمانی نیز بررسی شده است. این روش­ها قادرند به تنهایی و یا هم‌زمان با داروهای دیگر در درمان انواع بیماری­های روانی، شنوایی، دیابت، سکته، سرطان، بیماری­های عروقی، عفونت­ها، پوکی استخوان، انسداد شریان­های قلبی، آب سیاه یا گلوکوم، آسیب­های عصبی، زخم­های پوستی و شکستگی­های استخوان به کار گرفته شوند. Lakhovsky, Georges. The secret of life. Health Research Books, 1996. P.227. M. Clement, The waves that heal, Mokelumne Hill Pr, 1963, p.63. B. Lynes, The cancer conspiracy: betrayal, collusion and the suppression of alternative cancer treatments, Elsmere Pr, 2002, p.256. Kremkau, Frederick W. "Cancer therapy with ultrasound: a historical review." Journal of clinical ultrasound, Vol.7, No.4, 1979, pp.287-300. Dungel, Peter, Joachim Hartinger, Sidrah Chaudary, Paul Slezak, Anna Hofmann, Thomas Hausner, Martin Strassl, Ernst Wintner, Heinz Redl, and Rainer Mittermayr. "Low level light therapy by LED of different wavelength induces angiogenesis and improves ischemic wound healing." Lasers in surgery and medicine, Vol.46, No.10, 2014, pp.773-780. Horowitz, Leonard G. "DMD Healing Codes for the Biological Apocalypse." Medical Veritas International, 1999, p.537. Robertson, Valma J., and Kerry G. Baker. "A review of therapeutic ultrasound: effectiveness studies." Physical therapy, Vol.81, No.7, 2001, pp.1339-1350. Baker, Kerry G., Valma J. Robertson, and Francis A. Duck. "A review of therapeutic ultrasound: biophysical effects." Physical therapy, Vol.81, No.7, 2001, pp.1351-1358. Harrison, Andrew, Sheldon Lin, Neill Pounder, and Yuko Mikuni-Takagaki. "Mode & mechanism of low intensity pulsed ultrasound (LIPUS) in fracture repair." Ultrasonics, Vol.70, 2016, pp.45-52. Rosenthal, Ionel, Joe Z. Sostaric, and Peter Riesz. "Sonodynamic therapy––a review of the synergistic effects of drugs and ultrasound." Ultrasonics sonochemistry, Vol.11, No.6, 2004, pp.349-363. Padilla, Frédéric, Regina Puts, Laurence Vico, and Kay Raum. "Stimulation of bone repair with ultrasound: a review of the possible mechanic effects." Ultrasonics, Vol.54, No.5, 2014, pp.1125-1145. Ter Haar, Gail. "Therapeutic applications of ultrasound." Progress in biophysics and molecular biology, Vol.93, No.1-3, 2007, pp.111-129. Clark, Hulda Regehr, and Kitt Weagant. The cure for all cancers. New Century Press, 1993, p.623. Hrazdira, I., J. Škorpıková, and M. Dolnıkova. "Ultrasonically induced alterations of cultured tumour cells." European journal of ultrasound, Vol.8, No.1, 1998, pp.43-49. Morgan, Richard A., and R. Michael Blaese. "Gene therapy: lessons learnt from the past decade." BMJ: British Medical Journal, Vol.319, No.7220, 1999, p.1310. Patel, Aniruddh D. "A new approach to the cognitive neuroscience of melody." The cognitive neuroscience of music, 2003 pp.325-345. Melzack, Ronald. "Pain and the neuromatrix in the brain." Journal of dental education, Vol.65, No.12, 2001, pp.1378-1382. S. Mitragotri, “Healing Sound: The Use of Ultrasound in Drug Delivery and Other Therapeutic Applications”, Nature Reviews Drug Discovery, Vol.4, 2005, pp.255–260. Yu, Tinghe, Zhibiao Wang, and Timothy J. Mason. "A review of research into the uses of low level ultrasound in cancer therapy." Ultrasonics sonochemistry, Vol.11, No. 2, 2004, pp.95-103. Hijazy, A., H. Al–Smoudi, M. Swedan, N. Qaddoum, Hasan Al–Nashash, and K. G. Ramesh. "Quantitative monitoring of bone healing process using ultrasound." Journal of the Franklin Institute, Vol.343, No.4-5, 2006, pp.495-500. Wu, Feng, Zhi-Biao Wang, Wen-Zhi Chen, Jian-Zhong Zou, Jin Bai, Hui Zhu, Ke-Quan Li et al. "Extracorporeal focused ultrasound surgery for treatment of human solid carcinomas: early Chinese clinical experience." Ultrasound in medicine & biology, Vol.30, No.2, 2004, pp.245-260. Lejbkowicz, Flavio, and Samuel Salzberg. "Distinct sensitivity of normal and malignant cells to ultrasound in vitro." Environmental health perspectives, Vol.105, Suppl.6, 1997, p.1575. Yu, Tinghe, Zhibiao Wang, and Sen Jiang. "Potentiation of cytotoxicity of adriamycin on human ovarian carcinoma cell line 3AO by low-level ultrasound." Ultrasonics, Vol.39, No.4, 2001, pp.307-309. Kardos, Nathalie, and Jean-Louis Luche. "Sonochemistry of carbohydrate compounds." Carbohydrate Research, Vol.332, No.2, 2001, pp.115-131. Tachibana, Katsuro, Toshiki Uchida, Kazuo Tamura, Haruhiko Eguchi, Nobuya Yamashita, and Koichi Ogawa. "Enhanced cytotoxic effect of Ara-C by low intensity ultrasound to HL-60 cells." Cancer letters, Vol.149, No.1-2, 2000, pp.189-194. Tata, Darrell B., Floyd Dunn, and Donald J. Tindall. "Selective clinical ultrasound signals mediate differential gene transfer and expression in two human prostate cancer cell lines: LnCap and PC-3." Biochemical and biophysical research communications, Vol.234, No.1, 1997, pp.64-67. Wasan, Ellen K., Dorothy L. Reimer, and Marcel B. Bally. "Plasmid DNA is protected against ultrasonic cavitation‐induced damage when complexed to cationic liposomes." Journal of pharmaceutical sciences, Vol.85, No.4, 1996, pp.427-433. Lagneaux, Laurence, Eric Cordemans de Meulenaer, Alain Delforge, Marielle Dejeneffe, Martine Massy, Carine Moerman, Baudouin Hannecart, Yves Canivet, Marie-Françoise Lepeltier, and Dominique Bron. "Ultrasonic low-energy treatment: a novel approach to induce apoptosis in human leukemic cells." Experimental hematology, Vol.30, No.11, 2002, pp.1293-1301. Honda, Hidemi, Qing-Li Zhao, and Takashi Kondo. "Effects of dissolved gases and an echo contrast agent on apoptosis induced by ultrasound and its mechanism via the mitochondria-caspase pathway." Ultrasound in medicine & biology, Vol.28, No.5, 2002, pp.673-682. Okamoto, Hidehiko, Munehisa Fukushima, Henning Teismann, Lothar Lagemann, Tadashi Kitahara, Hidenori Inohara, Ryusuke Kakigi, and Christo Pantev. "Constraint-induced sound therapy for sudden sensorineural hearing loss–behavioral and neurophysiological outcomes." Scientific reports, Vol.4, Article number: 3927, 2014. Naghdi, Lili, Heidi Ahonen, Pasqualino Macario, and Lee Bartel. "The effect of low-frequency sound stimulation on patients with fibromyalgia: a clinical study." Pain Research and Management, Vol.20, No.1, 2015, pp.e21-e27. Bhatara, Anjali, Anna K. Tirovolas, Lilu Marie Duan, Bianca Levy, and Daniel J. Levitin. "Perception of emotional expression in musical performance." Journal of Experimental Psychology: Human Perception and Performance, Vol.37, No.3, 2011, p.921. Salimpoor, Valorie N., Mitchel Benovoy, Kevin Larcher, Alain Dagher, and Robert J. Zatorre. "Anatomically distinct dopamine release during anticipation and experience of peak emotion to music." Nature neuroscience, Vol.14, No.2, 2011, p.257. Brandes, Vera, Darcey D. Terris, Claudia Fischer, Adrian Loerbroks, Marc N. Jarczok, Gernot Ottowitz, Georg Titscher, Joachim E. Fischer, and Julian F. Thayer. "Receptive music therapy for the treatment of depression: a proof-of-concept study and prospective controlled clinical trial of efficacy." Psychotherapy and psychosomatics, Vol.79, No.5, 2010, pp.321-322. Khalfa, Stephanie, Simone Dalla Bella, Mathieu Roy, Isabelle Peretz, and Sonia J. Lupien. "Effects of relaxing music on salivary cortisol level after psychological stress." Annals of the New York Academy of Sciences, Vol.999, No.1, 2003, pp.374-376. Chanda, Mona Lisa, and Daniel J. Levitin. "The neurochemistry of music." Trends in cognitive sciences, Vol.17, No.4, 2013, pp.179-193. Dolmans, Dennis EJGJ, Dai Fukumura, and Rakesh K. Jain. "Photodynamic therapy for cancer." Nature reviews cancer, Vol.3, No.5, 2003, p.380. Dougherty, Thomas J., Charles J. Gomer, Barbara W. Henderson, Giulio Jori, David Kessel, Mladen Korbelik, Johan Moan, and Qian Peng. "Photodynamic therapy." JNCI: Journal of the national cancer institute, Vol.90, No.12, 1998, pp.889-905.